Microsoft WVD (Windows Virtual Desktop) is coming and Liquidware is hearing from many customers that they plan to deploy a proof-of-concept or pilot to test the waters as soon as possible. Microsoft has a public preview program in the works and you can now register here to apply for access to the program. If you’ve been following Microsoft WVD you’ve seen that Liquidware has been named by Microsoft to the short list of focused partners that Microsoft is working closely with, as mentioned in this Microsoft blog. The Liquidware Essentials suite provides key Adaptive Workspace Management solutions for every phase of a Microsoft WVD deployment and production environment. Liquidware’s popular suite includes assessment, application planning and layering, migration, ongoing user environment management, and user experience monitoring & diagnostics. The team here at Liquidware have been working closely with Microsoft for the past year in anticipation of the release of Microsoft WVD. We’ve tested WVD and are impressed. The Microsoft WVD team have also tested our solutions and we’re already working with select joint partners and customers ahead of the public preview. 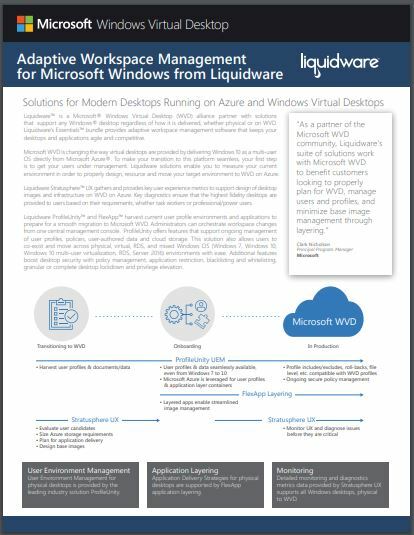 Liquidware and Microsoft have just finalized this new joint solution brief to clearly define how we work together to deliver a modern desktop deployment from Microsoft Azure with full Application Layering, User Environment Management, and User Experience Monitoring & Diagnostics. Organizations interested in Microsoft WVD can start preparing today with Liquidware Essentials by downloading a free trial version of Stratusphere to get an assessment of your current application usage, size your anticipated storage and compute on Microsoft Azure, and baseline your current Windows desktop user experience rating. A fully functioning trial version of ProfileUnity can also be downloaded free to lay the groundwork for a seamless migration to Microsoft WVD (even from Windows 7 to 10) and works to extend the functionality of Microsoft’s FSlogix profile solution with comprehensive User Environment Management features. FlexApp application layering is an integrated part of ProfileUnity and adds significant value and benefits to a WVD environment by greatly simplifying base image management and enabling applications to be layered at logon or by exclusive click-to-layer on-demand technology. Your organization can get started on the path to Microsoft WVD today by preparing for a clear on-boarding plan, migration planning, and user experience assurance with Liquidware Essentials. For more information visit Liquidware.com.